Jessica is the director of Community School Student Partnerships (CSSP), a student–run club that coordinates over 200 Penn students to serve as mentors in the Netter Center’s five designated University Assisted Community Schools: Comegys School, Huey School, Lea School, Sayre High School and West Philadelphia High School. The Netter Center aims to provide these schools with University resources to empower the community. Penn’s impact on local education isn’t something that most students think about on their way to class. Philly public schools are buildings on the way to Honest Tom’s, or names on flyers for tutoring groups. When students graduate, names like ‘Lea’ and ‘Penn Alexander’ will remain meaningless as they receive their diplomas at Franklin Field. For that Penn education, 53% of students can afford to pay over $64,000 a year. But at the Netter Center’s Community Schools, over 94% of the students are considered to be economically disadvantaged. At 3:09 p.m., the paved playground off 47th St. is filled with Lea students. Some dribble basketballs across the court while others climb through the school’s playground. Students enrolled in the Netter Center’s after–school program stick around and head in to the school for extra classes and homework help. Last fall, after years of benefitting from its Netter Center programs, the Lea School's relationship with Penn grew to a university–wide partnership. Graduate School of Education professor Caroline Watts was named the partnership director. According to Watts, the grave condition of public schools in Philadelphia and Pennsylvania put pressure on Penn to take action with the schools in its community. “[It pushed] everyone to really start thinking about what we were going to be able to do to improve the quality of education available to kids in this city,” she said gravely. In recent years, bad news about public schools in Philadelphia has become the norm. Since 2013, dozens of schools have closed, including Alexander Wilson, a former University Assisted–Community School. Last month, public schools came dangerously close to delaying the start of the school year; they were able to open on time only after millions of dollars in budget cuts. And just last week, in a move that prompted students to “strike” for their teachers, the School Reform Commission cut ties with the Philadelphia Federation of Teachers. Starting in December, teachers will need to contribute to their own healthcare costs and saved funds will be funneled back to Philly schools. Some of this money may go to Lea, where sixth–grade parent Maurice Jones is the president of the Home and School Association. “We’ve been effective in getting [Penn] involved,” he says. 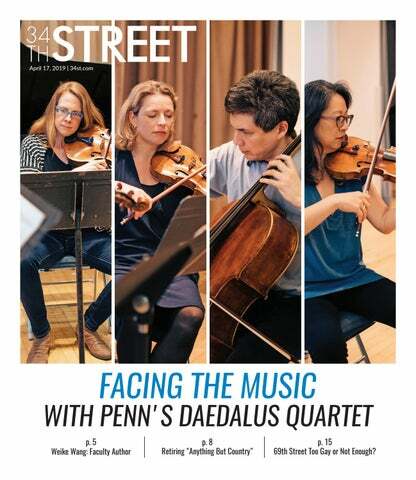 “They know it’s to their benefit to participate.” Due to Penn’s partnership, Lea now has a social worker, music classes and longer library hours. After the 2012–2013 school year, the School District of Philadelphia labeled Penn Alexander the “city leader” in achievement on statewide exams. Meanwhile, Lea students struggled to meet the city’s average scores. In 2012, just 36.2% of Lea third–grade students tested proficient or advanced in reading on the Pennsylvania System of School Assessment. At Penn Alexander, 93.8% of third grade students did. At 43rd and Locust streets, the Penn Alexander School is just four blocks east of Lea. For some, the school serves as an example of “Penntrification,” or the University’s intrusive gentrification of the West Philadelphia area. After a string of violent crimes targeting Penn students and faculty members shook the community in 1997, then–President Judith Rodin responded with the West Philadelphia Initiatives, a commitment from the University to revitalize the University City area. The Fresh Grocer, Rave Theatre and many retail shops lining campus opened during this time—a history few Penn students think about during late–night grocery runs and movie nights. Penn’s push for neighborhood renewal included the establishment of Penn Alexander just blocks away, which opened in 2001 as a partnership between Penn, the School District of Philadelphia and the Philadelphia Federation of Teachers. Penn’s support of the school is well known among involved Philly parents and university affiliates: the University provides $1,330 per student at Penn Alexander, which adds up to about $700,000 per year of additional funding. The university has pledged to continue this partnership until 2021. While Penn Alexander has become one of the best public schools in Philadelphia, it’s also changed the area around it. A 2011 report from the Penn Institute for Urban Research revealed that between 1998 and 2011, housing prices in the Penn Alexander catchment area “increased in value by 211.5%,” an appreciation rate more than twice the rate of West Philadelphia and more than three times that of Philadelphia as a whole. Census data from 2000 and 2010 mark considerable demographic shifts in the census tracts encompassing the Penn Alexander catchment area: while the black population has decreased, the white and Asian populations have gone up. During the 2013–2014 school year, Penn Alexander’s student body was 39.5% white, 25.1% African American, and 17.7% Asian. According to the School District of Philadelphia, 46.4% were economically disadvantaged. In the past decade, changes in the Penn Alexander catchment area have raised questions about the effects of university intervention in neighborhoods and schools. While Penn Alexander’s establishment provided many with a viable school option and a safer neighborhood, it also displaced many of the residents that needed it the most. But back at the Netter Center, Rita Hodges is optimistic. The success of Penn’s partnerships will instead hinge on people and the time that Penn affiliates commit to working in West Philly schools. Money doesn’t necessarily translate to the nurses, social workers, counselors, and opportunities that they need. Correction: An earlier version of this article stated that the Lea School became a Netter Center University Assisted Community School in 2013, and Caroline Watts became the partnership director. It has been updated to reflect that, in 2013, the university expanded its relationship from Netter Center programs to a university wide partnership. Caroline Watts was named the partnership director. Sterling Baltimore is the Community School Site Director at Lea. Clare Lombardo is a sophomore English major from Atlanta, GA. She is the current film editor for 34th Street Magazine.